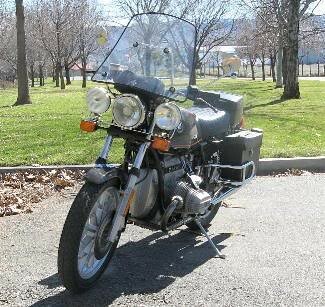 We purchased our 1978 R45/N about 9 years ago from a 'friend of a friend'. He was having some health issues and could no longer ride on two wheels. Not too many of these here in the states, and I thought it would be a fun addition to the stable. I've only put about 700 miles on it. One of the last times I rode the R45 was to the National in Redmond, OR back in 2010. Spouse tells me on the way home that the bike is smoking a bit and it stinks something fierce. Later that fall I acquired a compression tester and results were pretty much as I expected. I could have sworn I recorded the numbers, but where I stuck that piece of paper eludes me to this day. The 45 became a "when I have time" project. Almost 7 years later, I've barely started. 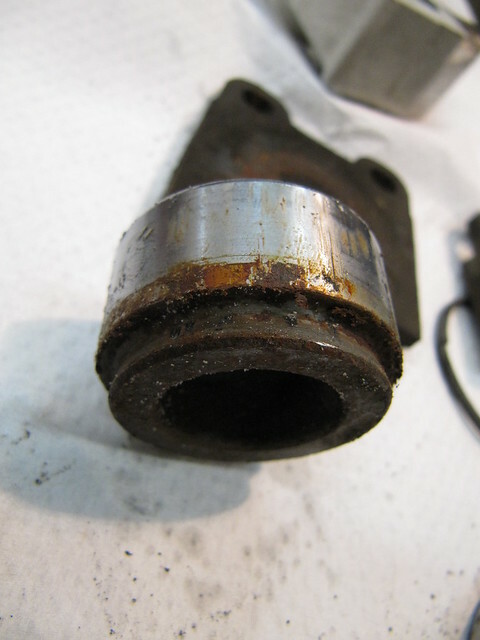 I did get a valve job done locally, but the right side intake was so far off it couldn't be properly adjusted. Head are now packed up in a box long with a valve kit from Moto Bins. 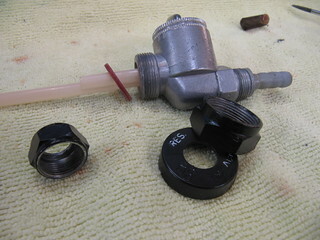 One of my Guzzi mechanics recommended a shop in Ballard, WA to re-do the valves. I'll drive those over next week. I ordered a bunch of bits from Moto Bins, mostly stuff that was obviously needing to be replaced. Oil pan screws, rubber grommets, points, brake lines, pipes, etc. I've taken the front end apart. Waiting on new steering head bearings, and trying to decide if I should just re-use the brake pistons and at some point in the future have a set made. Or keep the bike on hold while I save up for a Brembo. I REALLY want to keep this bike as original as possible, so I'm thinking the Brembo will be a last resort. 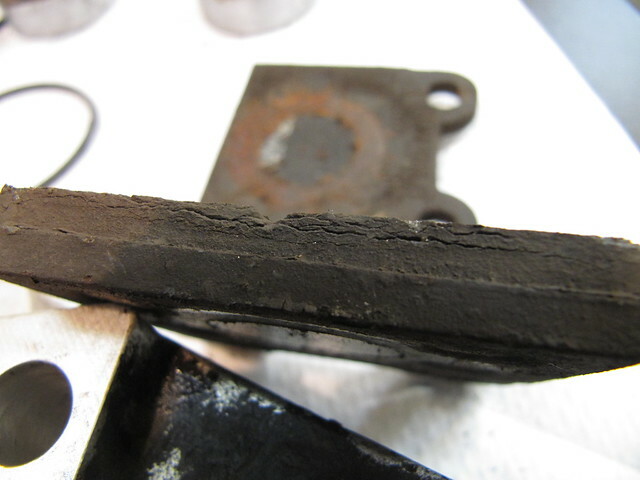 Brake pads appear to be delaminating (that was the first word that came to mind). 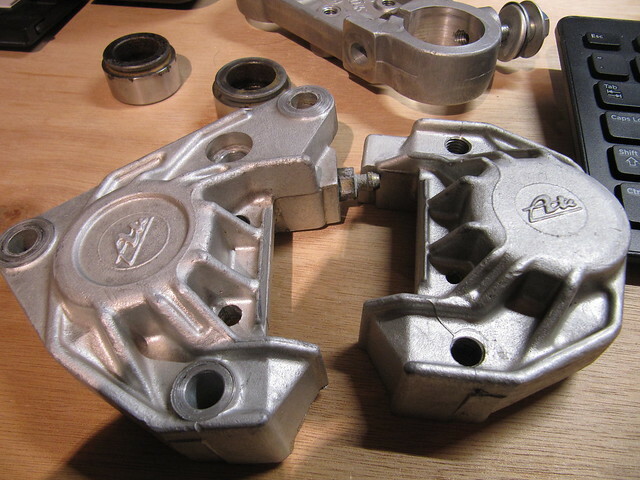 Those will be on order soon, along with a caliper O/H kit. Calipers were pretty dirty, but I cobbled up a DIY soda blaster setup. Arm and Hammer makes some soda blasting media in different grades, I picked up a 50lb sack of the medium grade at my local Harbor Freight. Stuff works pretty good, and isn't as dusty as plain baking soda. After. Little bit of work to be done yet, but I'm pleased with how the calipers came out. I'm a bit concerned about the pistons. From what I'm reading the pitting at the top will not effect the braking. Will save up for a new set of pistons to be done at a future date. The handle bar mounted master cylinder is another matter entirely. I have replaced all the lines with s/s, along with new pipes. But the fluid leakage has bubbled off a bunch of paint. My little soda blaster isn't powerful enough to take the paint off, I'm thinking maybe I'll just place it in a small tub with a bottle of 10 year old, unused brake fluid. Won't hurt it, but the paint will be easy to wipe off. haha Considering that the round m/c's are Unobtainium, I'll have to get creative with stripping and re-painting. That's about as far as I've gotten. Only one day off for the next two weeks (OT slave here, saving up for trip to Thailand), so no more work to be done until the end of the month. In the mean time, I'll get some parts ordered and plan for the next round of work. And figure out of the shocks really are supposed to have the rubber ring on them. 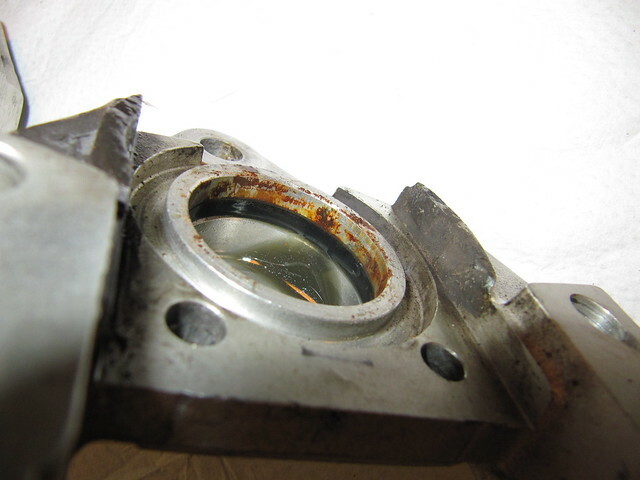 The caliper pistons look just about re-usable to me as the corrosion is not in the section that comes into contact with the seal. 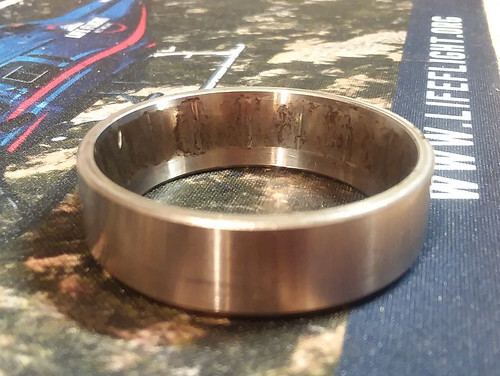 However if you do re-use them I would polish out the rust back to bare metal including the area where the dust seal sits and inside the hollow part. 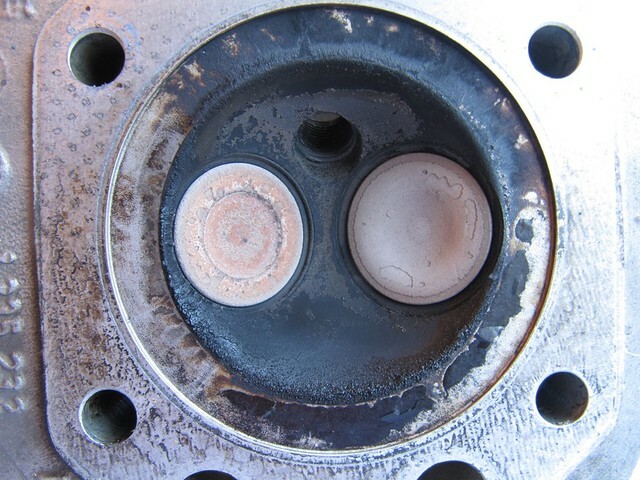 Most important of all re-assemble using brake grease (red rubber grease or similar) on all exposed parts of the piston or it will be rusty again in no time. I really wish I'd painted the hollow part so you might consider doing that. Progress has been slow due to me taking advantage of the available overtime at work and trying to get the spring house chores done before late summer. Weather here has been pretty ugly. Its been a cold and rainy spring. Every time I have time to do outside chores, I can't. Oh well. I got the heads taken to a reputable shop (Hill Machine Headworks in Ballard, WA). Shop was recommended to me by a Guzzi mechanic. Their bread and butter is marine work. It was kinda cool to see these giant engine bits there. Its going to take a few weeks to get it complete, so in the mean time, I took stock of what needs to be done and got a bunch of stuff ordered. Brake o/h kit, master cylinder o/h kit, fork parts, front brake pads, misc screws and gaskets from Bob's and Moto Bins. I also ordered up steering head bearing and race removal tools, a swing arm socket and a carb synch adapter from Northwoods Airheads. 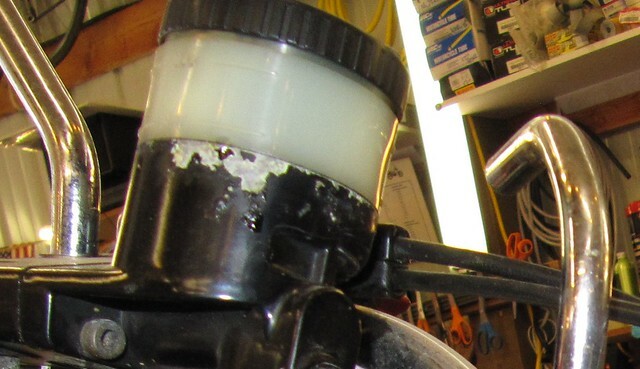 I've got the master cylinder assembly soaking in brake fluid. About 90% of the paint is off, I give it a few more days of soaking and there will be enough off that it'll be a piece of cake to soda blast off the rest. I took the battery out along with the battery box. Three rounds of Naval Jelly and 00 steel wool later, all the rust is gone. What I find interesting is that it looks like the primer on both of those is the green stuff that is used on aircraft. I can take it to the guys that re built our Stinson, but instead, I think I will use some of the primer that my spouse uses on cars when he has to remove rust before he can replace the windshield. I wonder though. Spent some time today swapping out the winter tires on my Vibe for the summer tires. I am having my Plain Jane black (and rusted/pitted) 'winter wheels' sandblasted and powder coated next month. Maybe they can do the battery box as well. As I await parts and tools, I will swap out the front tire and check the wheel bearings, clean up the under tank electrics area, and try to figure out how to wire the driving lamps, so I don't let out all the magic smoke out of the wires. Some progress made in the last couple weeks. Going a bit slower than I would like, but, nothing to be done about that. 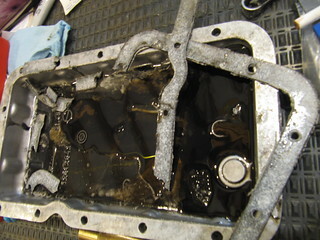 Carefully soaked the reservoir assembly in the suggested brake fluid/acetone mix. And some quality time with a block of wood and a rubber mallet, managed to separate the halves. Got them both cleaned up with 0000 steel wool, and primered and painted. Also cleaned up and sprayed the battery box. 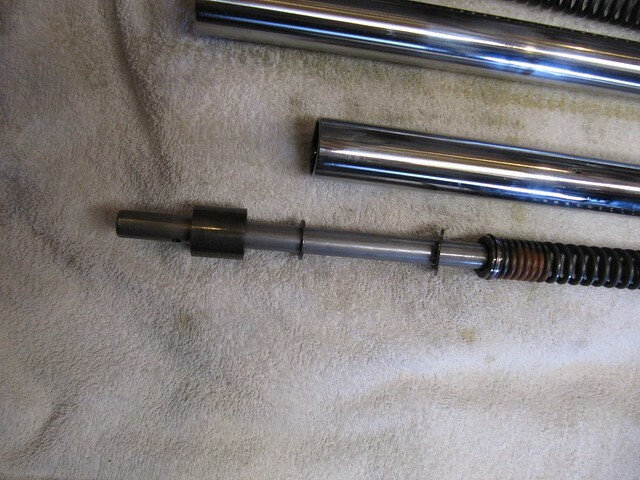 I'll give them another day to dry then get them put back together with the new plunger. Got the brake caliper put back together with new pads and a Speed Bleeder. I got all the rust cleaned off the pistons, then took some windshield primer to them, then masked and sprayed them. The spouse used the same primer on windshield pinch welds after scraping off all the old urethane. It bonds really well. Parts came in for the fork sliders. Even though mine didn't have the rubber rings, I added them. Looks like whoever did them last took a hammer to the edges...what a mess. 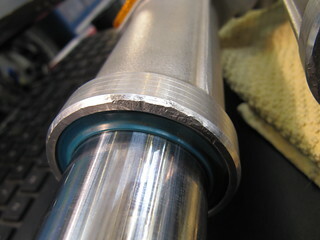 Even with a light coating of fork oil, the top edge of the seal kept folding in. Used a feeler gauge blade to un-tuck it. Drained all the old fuel out of the tank and took the petcock off. Found a couple bits of liner paint stuck to one of the straws. And there was a passel of crud on the screen. Got it all cleaned and prettied up and new bits installed. I've primered two of the nuts, and will repaint those, and will also repaint the lettering on the plastic indicator. 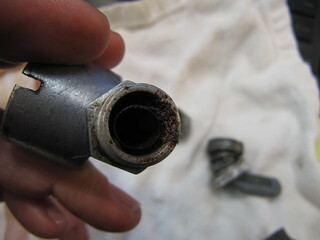 The paint on the brake lever was bubbling off, thanks to the m/c leak. And a bunch of the paint on the clutch lever was worn off. So, into the paint stripping mix they went. Interesting enough, when the paint comes off, they are different colored. Those will get primed and painted on my next days off. Cleaned all the baked on crud off the pistons, got the cylinders cleaned up and back on, with new push rod tube rubbers and the pistons got new rings. Cleaned out the oil pan and screen, scraped the glued on gasket off, put back together with a new gasket and new screws all around. 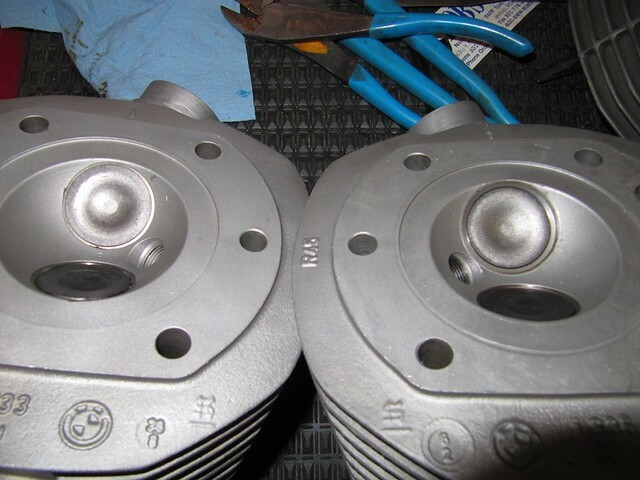 Carbs got re-done before the last ride, so those are already good to go. Lookin' good, Dee. 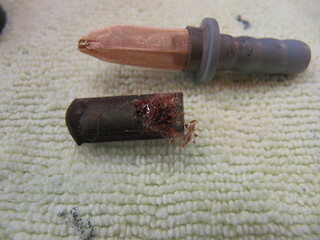 Depending on how much liner stuff you got out you might think about relining it. I've used several brands but I think the POR-15 tank liner kit is the best. On my '81 R100RT I put a gallon of straight Muriatic acid in the tank and rotated it 90 degrees every hour. After a 11-12 hour day of this the inside was completely gray - no liner left. Those are the early fork components as expected on a 78 model. 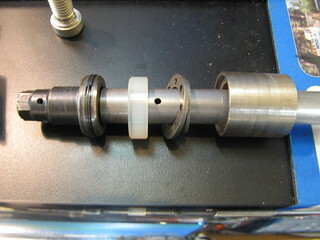 When you inset the damper body back in the fork legs and replace the big circlip, check there is no longitudinal play between the circlip and the valve body. 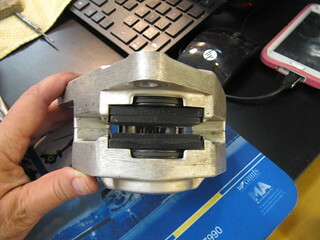 If there is any play at all you should use the shims that BMW introduced to prevent any movement. You'll see various thicknesses are available on the parts fiche. Mine needed a 20 thou shim. The different colors on the levers is interesting. I've got the same thing on my R65. 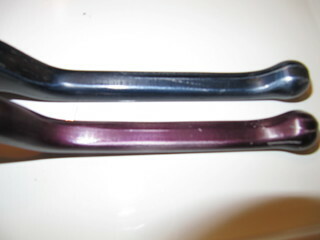 The brake lever is black, but the clutch lever is the same sort of dark purplish color that's in your photo. I always assumed that the previous owner dropped the bike and replaced the clutch lever with the purple one, but maybe it was actually a thing with those bikes. 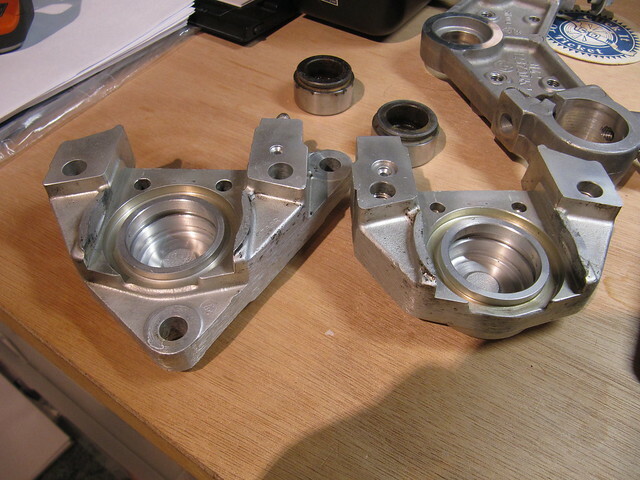 Well, I finally got the heads back from the machine shop. The local shop I took them to the first time did a crappy job. 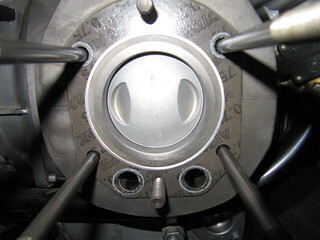 Right side intake was so far recessed that the valve couldn't be adjusted. Teach me to take the parts to a shop that has no idea what an airhead is. Oh well. Ordered up a valve kit from Moto Bins, and took everything to Hill Machine Headworks in Ballard, WA. They mainly do marine work, but they have a guy that also does BMW stuff. I have a couple days off and the temps are no longer lingering in the low 100's (F), so I may spend some time after karate class putting them on the bike. You'll be ridin' in no time, Dee! Wow, can't believe its been a year since I added to this. Got the heads/cylinders reinstalled, carbs rebuilt and installed. 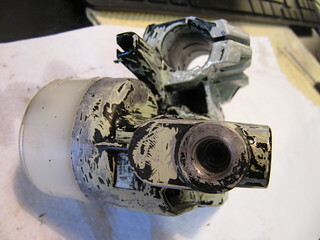 Front master cylinder is all painted and re-assembled. New stainless steel brake lines, new pipes. New steering head bearings installed and the front end is back together again. New rubber on the tires, and the electrical stuff is all done as well. This last month has been miserable....so many fires in my area. Less than 1/4 mile visibility and 100F+ temps. And in the middle of all that, the condenser fan motor on my home a/c seized up. yay! Cant say I'm too surprised, the unit is pushing 30 years old. Oh joy. I happened to have bearings on the shelf. Ended up pulling the swing arm off. That was fun. Got the races removed and new ones put in. 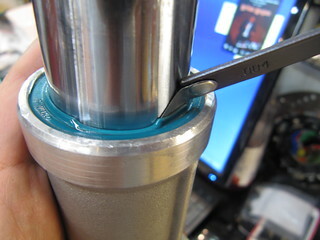 Packed the bearings with Honda moly paste. Reinstalling the thing was so much more fun that taking it out. 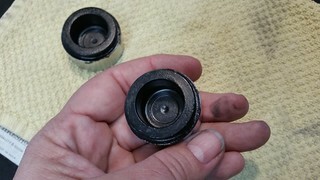 I had the torque adapter special tool from Northwoods Airheads to reinstall those 12 point screws back on the drive shaft. Would have been impossible to do that with out it. Getting the spacing correct was a chore. I ended up using feeler gauges to even it out. Its all cleaned up, everything is all packed with Honda Moly paste and its all back together. And it only took most of the day. Tomorrow I volunteered for a 6 hour OT shift. When that's done I'm going to pull the bearings out of the rear wheel. 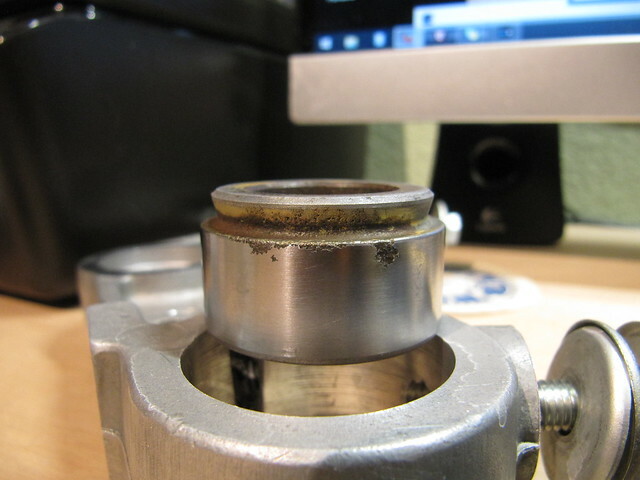 My rear splines have some rust on them. I cannot even imagine what the wheel bearings are going to look like. And Saturday will be a change of pace. 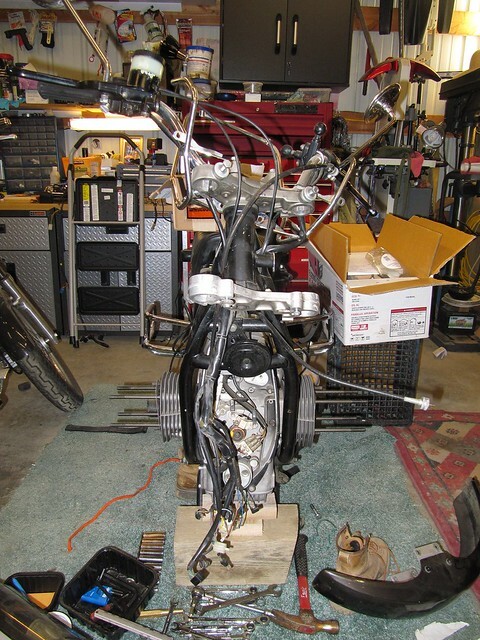 Going to do an annual and a fuel line quick disconnect replacement on a K1200LT. That bike is HUGE!